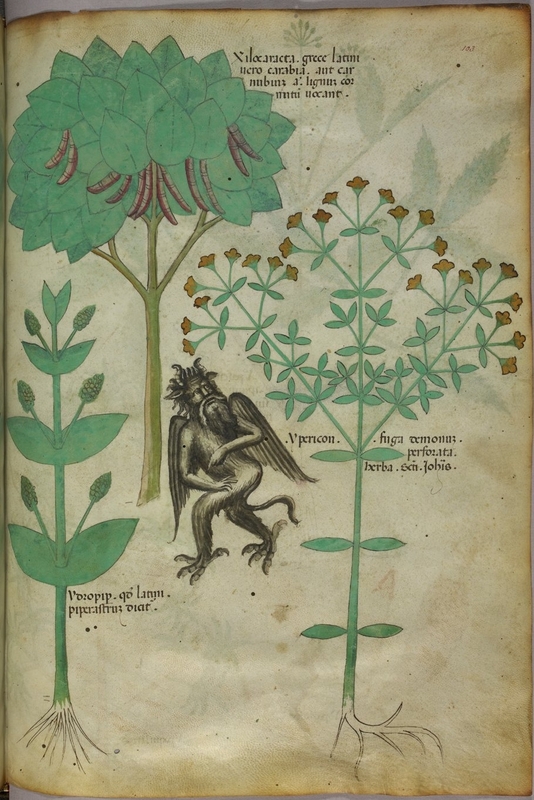 A friend recently passed along a fabulous blog called BibliOdyssey, as well as a post with illustrated manuscript belonging to a 15th c. herbal text titled the Codex Sloane 4016. Like other early manuscripts focusing on herbs, these treatises documented accumulated knowledge about medicinal plants from the oral tradition. In the image above you will immediately recognize St. John’s Wort as the medieval “ypericon”, known now by the latin hypericum perforatum. With the myriad uses for the invaluable St. John’s Wort, SSRI action, anti-viral activity, and vulnerary for nervous system-related symptoms among them, what I did not know was that St John’s Wort was also considered a demon repellent. And what a cute little demon we have here in this medieval illustration, not unlike the many forms of hybrid creatures found on the column lintels that would have surrounded monastic herb gardens of that period. I am sure every monastery had its St. John’s Wort patch for this reason, among the many other uses. Do pop back to this post to see the other lovely illustrated manuscripts from the Codex, as well as information about its facsimile at the British Library and even more delightful tidbits from their blog. And while you are at it, this wonderful collection of downloadable manuscripts, the Codex (Tractatus de Herbis) among them. Ahhh, if I were to go back to working towards a PhD again….I’d be sorely tempted. This entry was posted on Thursday, February 9th, 2012 at 9:04 pm and is filed under I N S P I R A T I O N, R E S E A R C H.	You can follow any responses to this entry through the RSS 2.0 feed. You can leave a response, or trackback from your own site. 2 Responses to Herbal Demon Repellent. No, really! I wish the picture were clearer; then I could translate the Latin in it. The only word I can really pick out is “fuga”, which = “flight” or “escape”.